New Mexico evokes thoughts of Native American culture, fused with American Western roots with a bit of Mexican and Spanish mixed in. Travelers to the Land of Enchantment are looking for authentic experiences that allow them a taste of this unique culture and two hotels in Albuquerque provide great bases for exploring the area and embracing the culture within their walls. The recently renovated Hotel Albuquerque is one of seven boutique properties from the Heritage Hotel Group, a tiny New Mexican chain that defines itself by its cultural hospitality. Each hotel reflects the culture of its specific location through architecture, art, cuisine and entertainment. The hotel features all the amenities one would expect from a four-star establishment, in addition to giving guests a glimpse into the culture of the area. “The hotel is simply the vehicle for us to tell the story of our heritage, “said Adrian Perez, president of Heritage Hotels. A very unique aspect of the hotel is that each property partners with a local cause and donates a portion of each night’s room revenue to it. In 2012 the Hotel Albuquerque is supporting the construction of a devotional altar in the Gaspari Chapel at the San Felipe de Neri Church in Old Town that has run a Sunday mass without interruption for 306 years. Guests can also match the donation the hotel makes from their room. “When you stay at Heritage Hotels you are making a difference, not just earning points and miles,” Perez said. 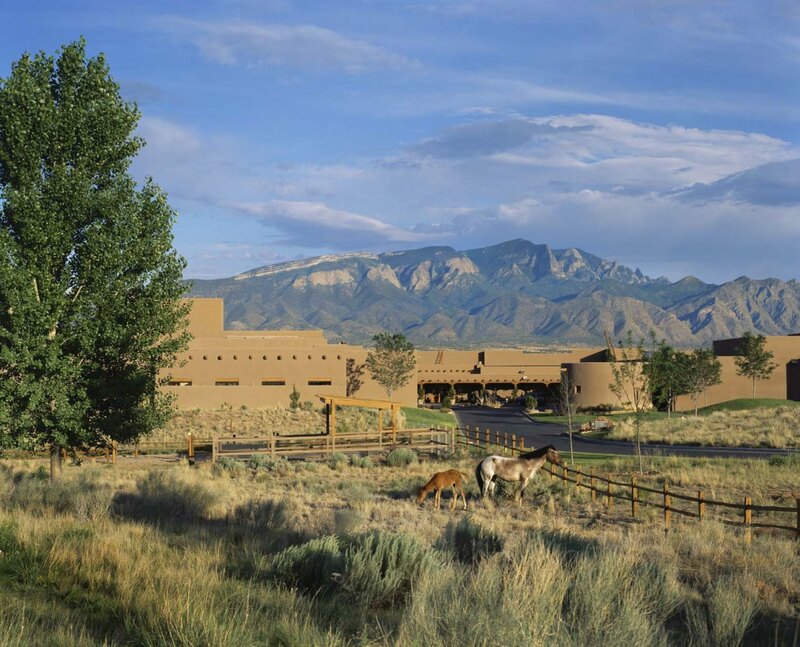 If you’re looking for a retreat in the area with cultural overtones, look no further than the Hyatt Tamaya located at the base of the Sandia Mountains. The large resort property brings the culture of the Tamayame people and the Santa Ana Pueblo to guests in a variety of ways. Today’s traveler is looking for authentic interactive experiences and the Hyatt Tamaya delivers it in spades. Guests can wander through the Cultural Learning Center on property or take part in a variety of activities designed to introduce the Tamayame culture. Depending on the day of your stay you can learn to make pueblo pottery, work side by side with a Tamayame cook to bake oven bread or even learn the fine art of stamping Navajo jewelry. Native American flute, dance and artesian demonstrations are also featured. The Mist Spa has won many industry accolades and highlights the Native American culture through unique treatments like Ancient Drumming or the Native Herbal Wrap. Whether you decided to stay in the heart of the action in Old Town, or enjoy the quiet solitude that New Mexico can deliver in spades, it will be easy to incorporate the culture into your stay with either of these unique properties.